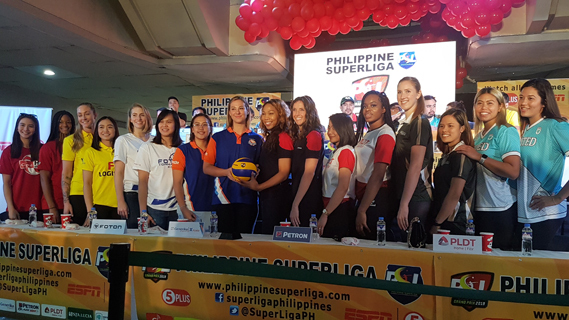 Last year’s finalists, the Petron Blaze Spikers and F2 Logistics Cargo Movers, are ready to add another chapter to their already momentous rivalry when the 2019 Philippine Superliga Grand Prix starts at the Ynares Sports Center in Pasig, on Feb. 16. Reigning champion Petron will bank on its two heavy-hitting guest players Stephanie Niemer and Katherine Bell, while the Cargo Movers attempt to bounce back with the addition of ex-Blaze Spiker Lindsay Stalzer, to complement the play of Becky Perry in the import-laden tournament. “I think it’s not new that Linday’s going to play here again. If I’m not mistaken, it’s her sixth year playing here, so I think if you’re going to watch all those the teams that she’s played for, you would see that she always gives her best,” said F2 team captain Cha Cruz on the arrival of the 2018 Grand Prix MVP to their team. Stalzer and Petron eked out a thrilling 25-19, 25-20, 22-25, 25-18 victory over the F2 Logistics last year to win the title. Coming back with much confidence this year, Bell and Niemer do not deny, though, that the other teams have also strengthened their core to try to steal the title from the Shaq Delos Santos-mentored squad. “My personality is I don’t care about the past. You know, last year is last year. It’s going to be a whole new season with a new group of girls coming into this season, so same mindset, work hard, get the result,” team captain Bell said. The 2019 PSL Grand Prix will kick off on Saturday with the United Volleyball Club taking on Foton Tornadoes Blue Energy, while the Generika-Ayala Lifesavers clashes with Sta. Lucia Realtor in the featured match. Other clubs seeing action in the eight-team tournament are the Cignal HD Spikers and the PLDT Home Fibr, which will compete for only the second time since 2013 in the PSL.